Today Fr. Salvatore Enzo del Brocco, C.P., Provincial of DOL Province Italy, arrived in Sydney. Tuesday at 6.45 a.m. Fr. Paul Francis Spencer, C.P., from PATR Province arrives. Both Enzo and Paul Francis are members of the International Preparatory Committee for the meeting of Young Passionist Religious taking place at Templestowe prior to WYD in Sydney. 26th June is the Feast of St. John and Paul. 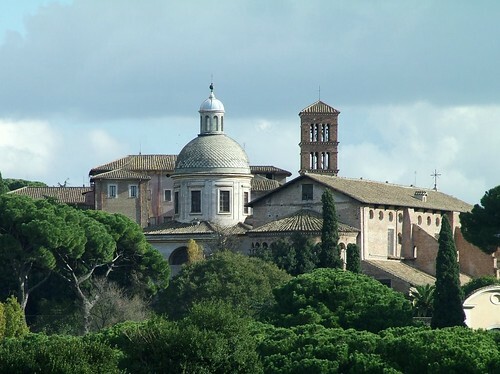 It was in 1773 that Passionists were given possession of the Basilica and Monastery of St. John and Paul in Rome. The Passionist Youth of the world are preparing to come to Australia for 2008 World Youth Day. Seen in this picture are Passionist Youth from the Vice Province of the Five Wounds (Bavaria and Austria) who will travel to Australia next week for WYD. Fr. 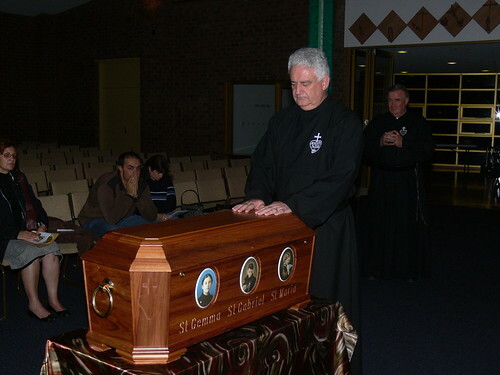 John Pearce, C.P., the Holy Spirit Province World Youth Day Coordinator, stops to pray before the relics of St. Gemma, St. Gabriel and St. Maria Goretti at St. Paul Apostle Church, Endeavour Hills. He’s probably praying for all the young people who will attend the Passionist Youth Encounter in Melbourne prior to World Youth Day in Sydney. He’s been a very busy Passionist these last months preparing for WYD. 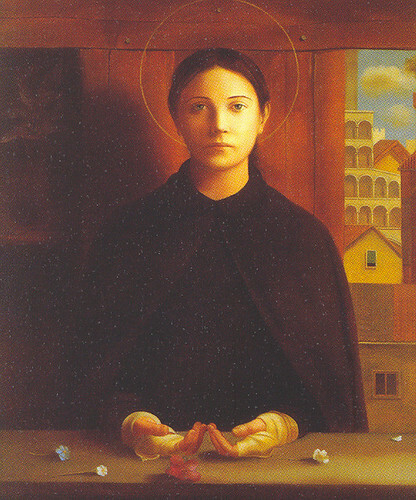 Today, 8th June, is the anniversary of the reception of the Stigmata by St. Gemma Galgani. On 8th June 1899 St. Gemma entered into a deeper experience of the Passion of Jesus by suffering the physical wounds of Christ on her own body. Oh Jesus, why am I not burned up with love for you? Why it is that my heart is not consumed with Love’s flame? Why is it that my love does not correspond to yours? Oh Jesus, how much time I have lost! How many years I could have loved You and I did not do so. But your bounty makes me hope to be able to make up for lost time. Why did you suffer for me, dear Jesus? For love! The nails … the crown … the cross … all for love of me. For You I sacrifice everything willingly. I offer You my body with all its weakness and my soul with all its love. My God, dear Jesus, remove whatever malice may be at the bottom of my offering, and then accept it. Do not abandon me, Jesus, I am yours. Take care of my soul. Think of what you have borne to save it. Surely they are right to say, “To suffer is to love”.